Here's a new candle place to take a look at. 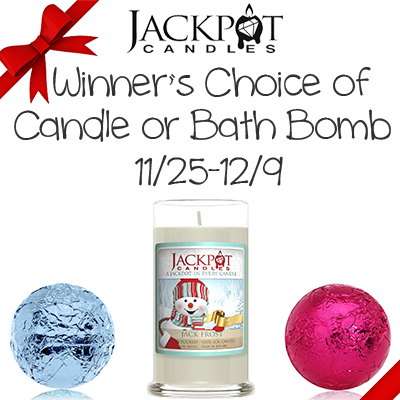 Or, you can win a bath bomb. Giveaway is US only and ends on 12/9. Good luck. Candles can be more than a light to accent your home décor; Jackpot Candles believe that candles can offer an experience that does not stop after the flame has died. Their hand-poured candles are made with 100% natural soy that creates a lovely, long-lasting flame to fill your home with amazing scents. Using only the best environmentally friendly materials, their candles provide bold, distinctive fragrances that fit any mood and any budget. Whether you crave the aromas of fresh baked holiday cookies and pies or the fresh, clean scent of flowering gardens and mountain breezes, their wide range of products will transform your home into a welcoming space of comfort and relaxation. I would choose a candle. I don't see a link to check out the scents, but I used to love the Jack Frost scent from Yankee Candle so I would probably give this one a try. I would chose a candle in Gardenia. Sweet Pea Jewelry Candle is what I would choose.